ASIAN LEOPARD CAT - ALC "Murphy"
First, who wouldn't want a friendly, little leopard as a companion! The most obvious appeal is their striking appearance. They are bred to mimic the look of wild cats, like Leopards and Clouded Leopards. Then, it is their engaging and playful, distinctive personalities that catch you. They love to be "part of the family" and are very interactive. So, read on... the more you know about them will make it clear as to why they are one of the most popular Domestic Pets. We're sure that you will want one to join your family! Historically, cats have been a part of human cultures throughout recorded history. Click HERE to find out more about how they began their relationship with humans. The Bengal Cat is a Domestic Cat breed that was a hybrid created by Jean Mill originally in 1963 to 1965. Jean started new bloodlines in the early 1980's and we all have Millwood Bengals (Cattery), and all of Jean's hard work, to thank for such a wonderful breed of Domestic Cat. Bengals really do "have it all" - the exotic looks of a Wild Cat and the temperament of a Domestic Cat. 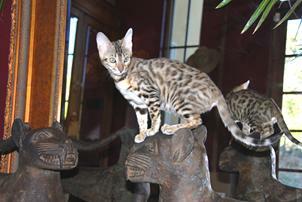 Santa Fe Bengal Cattery has Championship blood lines from Millwood and other Catteries. Bengals are originally a cross between the WILD "Asian Leopard Cat", Prionailurus Bengalensis (sub species, Bengalensis, from Bengal, India), commonly referred to as the "ALC," and most often with the Egyptian Mau, Felis Catus. 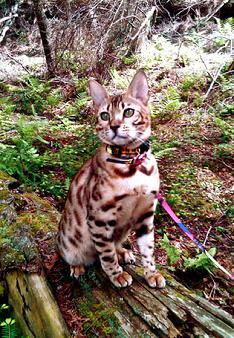 The Bengal breed received it's name from having the heritage of the Asian Leopard Cat first found in Bengal, India. Note the sub species "Bengalensis" that is listed in the ALC's scientific identification. When a Wild ALC is crossed with a Domestic Cat Breed, the progeny is designated by "Felis", rather than "Prionailurius". Felis means Domestic and all Domestic Cat breeds start with this designation. Both SBT and Early Generation Bengals are designated by Felis, which means "Domesticated House Cat". SBT Bengals have a very small percentage (1/12th or less) of the Wild genetics and Foundation Early Generation Bengals (F1,F2, F3) have higher percentages of the Wild genetics. We strongly feel that F1 Foundation Bengals (the first crossing of Wild and Domestic) are best for experienced Breeders only, however, the next crossings (F2 and F3) can be wonderful pets as they have mostly Domestic genetics. There are two pattern types of Bengal coats, also called pelts, in reference to their heritage to the sleek, shiny wild ALC “pelt.” Spotted/Rosetted or Marbled are the two Bengal coat patterns; both looking very much like a wild cat. The TICA accepted colors are Brown/Black, Snow, and Silver. Click HERE to find out about the TICA Breed Standard. Bengals are BIG on personality. They are outgoing, curious, playful, and affectionate. These cats are not timid or reclusive and enjoy being a part of the family. Reputed to being the most intelligent of all domestic cats, they will greet you at the door, play fetch, and walk on a leash – they adapt well to being "taught”. Despite their (desirable) differences from most Domestic Cats, SBT Bengals don't require special feeding or care. But just like any creature - cat, dog, human... when given high quality food and lodgings, the result will be better health and appearance. View photos of our beautiful Bengal Cats and Kittens on our Photo Gallery SBT Cats 1 and Photo gallery SBT Cats 2 pages. Check out our Foundation Cats page for more information about Early Generation Bengal Cats. Click HERE to find out more about "How Bengals are different from other Domestic Cats." Click HERE to watch a video of "How Bengals love to play fetch!" on our Facebook page. Click HERE to find out more about TICA (The International Cat Association). Click HERE to find out more about TIBCS (The International Bengal Cat Society) and the Bengal Breed. Click on the YouTube link below to watch an amazing video that shows what a Bengal is like! 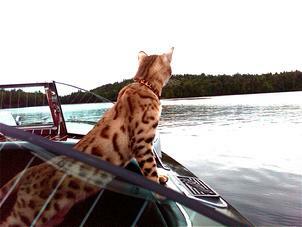 SANTA FE BENGAL SEVE' LOVES TO TRAVEL, GO BOATING, AND GOES EVERY WHERE WITH HIS HUMANS - HE EVEN GETS TO FLY IN A PRIVATE JET AND DOES IT ALL WITH GRACE! WE ARE VERY PROUD OF OUR BOY!! SEVE' ON A HIKE WITH HIS HUMANS IN NEW YORK STATE. HE LOVES TO TRAVEL AND SEE THE SIGHTS! The SBT BENGAL is Felis Bengalensis and is four generations (F4) or more away from the original cross with the WILD Asian Leopard Cat, Prionailurus Bengalensis. DOMESTIC Bengals are TICA registered and make superb House Cats! Most Bengal owners will want to have the wild look of a Bengal, but the reliable domestic temperament of a SBT Bengal. F1, F2, and F3 FOUNDATION BENGALS are the beginning of the Bengal Breed and are TICA registered. If raised by a very dedicated Breeder and placed with the right new owner, they can be excellent pets. They are not for everyone! Foundations can some times be more shy in their temperament, if not given the needed human contact, attention, and love and not everyone has the extra time to give. Initially, if not handled properly by the Breeder, these early generation cats can still have some of the wild habits, wild personality (preferring to be alone or with other felines, rather than with humans), and wild temperament traits. Choose your Foundation Bengal Breeder carefully and you can have a Foundation Bengal as a perfect, wild-looking companion! It is important to know about your new potential Kitten's genealogy, your potential Breeder choice, and to know what type of pet that is right for you. A Foundation Bengal can be the most perfect companion pet ever! Foundation Bengals are important to a dedicated Breeder for strengthening their genetic line and Breeding Program. At Santa Fe Bengal Cattery, we have chosen to take the step into breeding Foundation Bengals to strengthen our genetic line of Bengals. Breeding better Bengals is our goal, not just to breed Bengals. This is a huge commitment and we are very excited about our Cattery's future. We are now taking applications for potential Foundation 2 and 3 Kitten Owners. Contact us to find out more! Santa Fe Bengal Cattery has been a member, in good standing, of The International Cat Association (TICA) and of The International Bengal Cat Society (TIBCS) for all the years of membership, and has signed and participates in the Breeders' Code of Ethics for both organizations.